Feature: Debate: The Legalisation of Rhino Horn Trade. I spent some weeks in June – July 2016 researching and co-writing a voice-over script with my sister. She is a freelance journalist in Johannesburg. The script was for a documentary TV pilot being produced by Africa Cries productions. Being in two different hemispheres, continents and countries, my sister and I wrote experimentally, using mainly Skype and Google Docs as a way to both be writing and discussing the project at the same time. It was a super collaborative experience and towards the end of the project I was also able to fly out to South Africa to visit the rhino sanctuary where the filming was taking place. The issue: How one man and his team of vets and rangers, on a privately run reserve, are working to sustain rhino populations despite huge costs, drought, poaching and a growing stockpile of horn which is illegal to sell. It was a natural segway to this script writing project, when I was later invited to attend a debate here in London on the same topic. 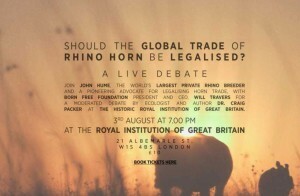 The speakers were John Hume, private rhino owner, and Born Free Foundation’s President and CEO, Will Travers. 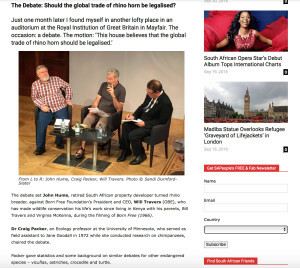 I pitched the article to www.sapeople.com who happily commissioned me to cover the debate for their publication. You can read my article online here or download the pdf by clicking on the thumbnail image above. Go to: Contact Sandi if you would like me write for your magazine, newspaper or website.